Generally, the smaller the chile, the hotter it is. Colors range from yellow, orange and green to red and black. Both fresh and dried chile peppers are available year-round. So pick a peck or two and unleash their spicy heat in your winter meals. 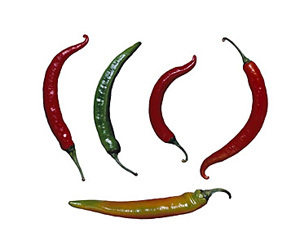 Select firm, brightly colored fresh chiles with shiny, unblemished skins. Avoid any with moldy stems, soft spots or wrinkles. Refrigerate fresh chiles in an open plastic bag for 7 to 10 days. Store dried chiles in an airtight container in a cool, dry place for up to 6 months. It’s best to wear rubber or plastic gloves when working with hot chiles and to avoid touching your face or eyes. The heat is located mainly in the oils inside the seeds and ribs,. These oils can irritate the skin and cause painful burning to the hands, lips and eyes. Always wash your hands, cutting board and knife thoroughly with warm soapy water after handling hot chiles and discard any used gloves. Rinse fresh chiles under cold water. The white ribs and seeds inside contain 80% of their fiery heat. These may be totally or partially removed to lessen the heat in a dish. To remove the ribs and seeds, cut the chiles lengthwise into halves. Remove the stems along with the ribs and seeds if desired, then chop or mince. To roast fresh chiles, see the Roasting Red Peppers Cooking School Video for directions. Dried chiles are often toasted before reconstituting in liquid. To toast dried chiles, place in a dry, heavy skillet; and cook on medium heat until fragrant and lightly toasted, turning frequently with tongs; cool. Soak the toasted, dried chiles in hot water until softened. Remove and discard the stems and seeds. Chop or purée in a blender with a small amount of water to form a paste. Use extra caution when adding hot chiles to a cooked dish. Start with a small amount since cooking intensifies the hotness of chiles. Low in calories and rich in vitamin C.
Fire up your favorite vegetable or fruit salsas with a bit of minced fresh chiles. Add eye-opening flavor to scrambled eggs and omelets by stirring in some chopped fresh chiles during cooking. Zip up burgers and OSCAR MAYER Wieners by topping them with sliced jalapeños and KRAFT Monterey Jack Cheese. Stir some chopped canned chipotles or puréed dried chiles into your favorite chili and stew recipes for a touch of smoky heat. Spice up stir-fries and other dishes by infusing the oil with chile flavor. Simply sauté a hot chile briefly in the oil. Remove and discard the chile and proceed with the flavored oil.